Whale watching company sees constant sales growth with Expedia Local Expert's intuitive platform. Over 25 years ago, Alan McGillivray was delivering mail to residents of the Southern Gulf Islands in an aluminum, high-speed Launch, in British Columbia, Canada. Today, the business has grown into what is now known as Prince of Whales Whale Watching. The company now has three locations, 14 vessels in the fleet, and proudly celebrates over 25 years of Whale Watching in the Pacific Northwest. 5 years ago—when Director of Sales Lauren Travan entered into a partnership with Expedia Local Expert®—it was evident having a strong presence online with a leading global brand would be an advantage to her organization. The tourism space was quickly changing, becoming more reliant on technology and specifically moving toward automation. Lauren saw that customers were increasingly looking to book online and selecting Expedia as their chosen platform so without this distribution channel the company was missing out on bookings and needed to automate their processes. With lofty goals to expand their presence further into the online market and reach adventure tourists throughout the world, something had to change. 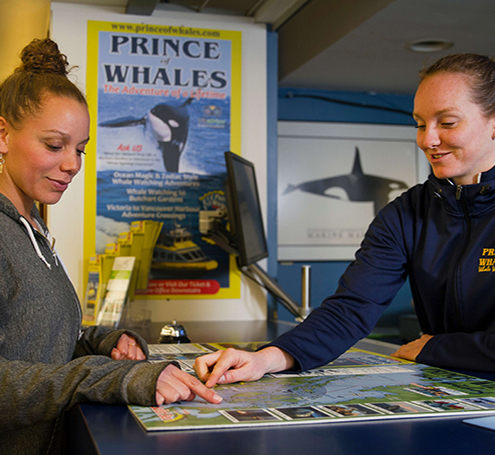 Lauren knew the potential of Expedia’s platform to provide customers the opportunity to book all-things-travel and was keen to utilize this familiar brand to the advantage of Prince of Whales Whale Watching. With the ability to access her account through the Local Expert Partner Central (LXPC) extranet, Lauren could easily update product information and manage tour inventory. By connecting her company’s reservations system to Expedia’s via API connectivity, she was also able to automate much of the reservations process. Offering instant confirmations to guests and eliminating the need for paper vouchers made booking simpler for guests and supported her company’s sustainability initiatives. Automated bookings allowed for a decrease in staff labor and led to an increase in sales. “Each year we see consistent improvements with Expedia’s technology which gives us the opportunity to target new audiences and offer a variety of tours unique to our company, setting us apart from our competitors.” Looking ahead, this will be key to drive even further exposure to their products.